Kaiser Chiefs are playing in Inverness this year. Indie rockers Kaiser Chiefs have today confirmed they will play a concert in Inverness this summer. The award-winning band will perform under the Live in the City banner at the Northern Meeting Park on August 17. Fronted by lead singer and former The Voice judge Ricky Wilson, the band first burst on to the world stage following the release of their debut album in 2005. They’ve scored numerous hits including Oh My God, Never Miss a Beat and Ruby, their infamous number one hit. Their sixth record Stay Together was released in 2016 and reached number four in the UK album chart. The band’s frontman, Ricky Wilson, said: “We’re really excited to be playing in Inverness this August as we’ve heard great things about the Highlands. Ricky is joined in the band by guitarist Andrew ‘Whitey’ White, Nick ‘Peanut’ Baines on keyboards, bassist Simon Rix and drummer Vijay Mistry. 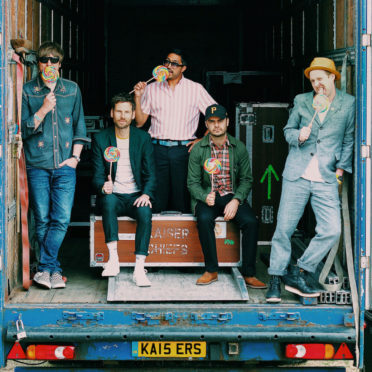 Claire Kidger of LCC Live, said: “We’re delighted to confirm Kaiser Chiefs to the line-up for Live in the City in Inverness. Live in the City is a series of music concerts being organised by local concert promoter, LCC Live, in Inverness this summer. Skipinnish (July 5), The Proclaimers (July 6), Madness (August 23) and Noel Gallagher’s High Flying Birds (June 8) have all been confirmed to perform in the city this year. Claire added: “We have a great line-up scheduled for Live in the City this summer, making it an unmissable series of outdoor music events. Tickets for Kaiser Chiefs go on sale at 9am on Friday from Ticketline (www.ticketline.co.uk; 0844 888 9991).